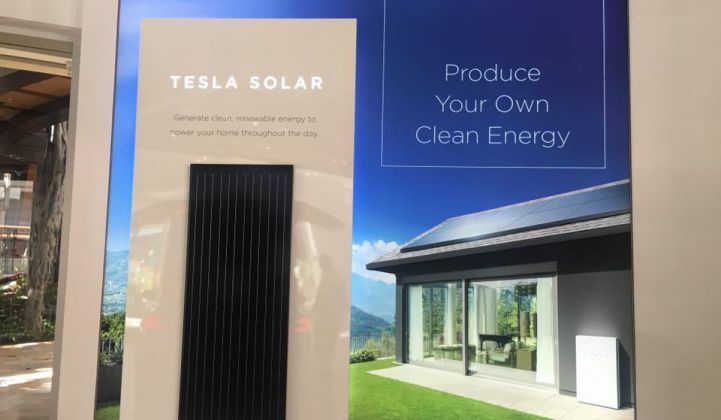 Tesla-branded solar panels have officially arrived in Tesla stores, marking another step in Tesla's ongoing integration with SolarCity. 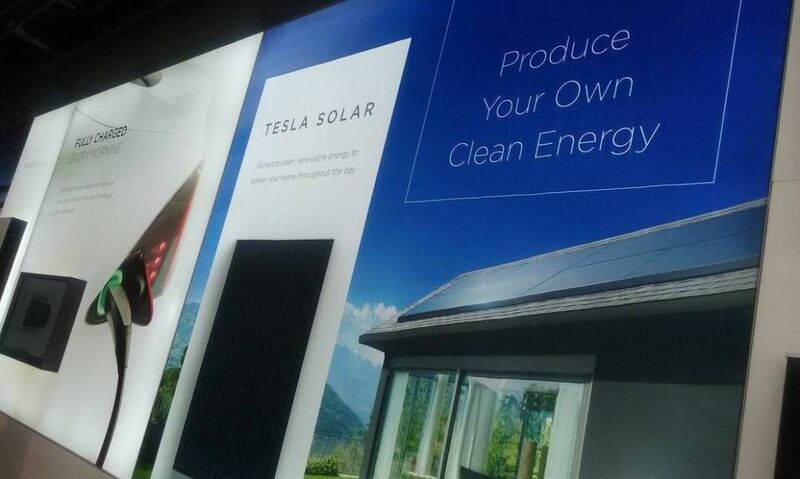 In an SEC filing from March 1, the company stated: "We plan to reduce customer acquisition costs by cutting advertising spend and increasingly selling solar products in Tesla stores." Tesla said it began offering solar products and services "in select stores" as of the first quarter of 2017. 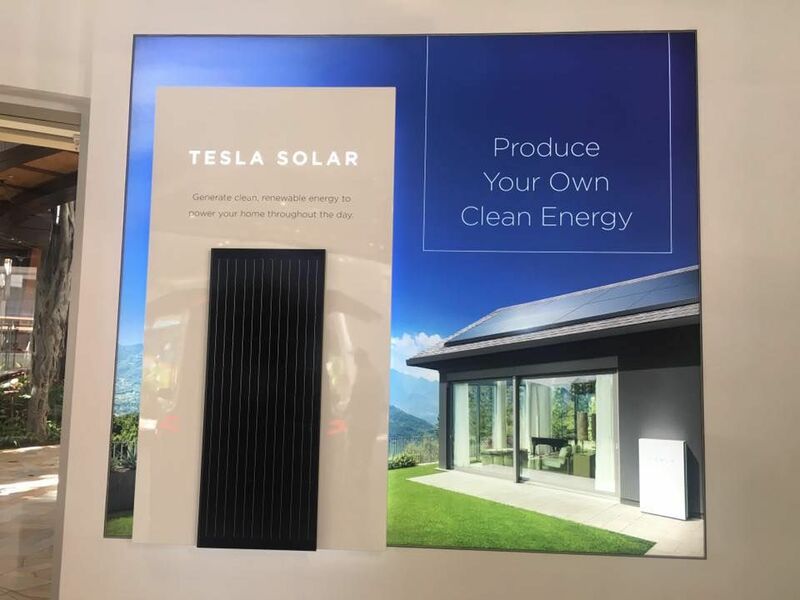 GTM visited Tesla showrooms in Santa Monica, San Jose, Palo Alto and Boston in late March, and found few references to solar products and services. Tesla salespeople in several of these locations were aware of the company's solar offerings -- including the forthcoming solar roof -- but there was no sales pitch or process in place. Things have changed. Electrek reported Sunday that "Tesla Solar" displays and actual panels have now been spotted on the West Coast. Commenter ElectriCourrier shared a photo of a Tesla Solar display in Honolulu, Hawaii. And Instagram user raina0624 recently shared a photo of a Tesla Solar display in Washington. Tesla's solar shingles have garnered a lot of attention since CEO Elon Musk first unveiled the new product last fall. Musk announced last month that solar roof orders were live and forecast that U.S. deployments would begin later this year. While the true cost of the solar roof is subject to some debate, Tesla claims it has already sold off enough tiles to be out of stock “well into 2018." Meanwhile, the company continues to sell standard solar panels. Given that the shingles are really aimed at customers looking to build a new roof, there are plenty of other people who are happy to go the more traditional route. But even with a familiar product, Tesla is looking to differentiate itself. In April, the company unveiled a "sleek and low-profile" solar panel made by Panasonic that will be manufactured at Tesla's Gigafactory 2 in Buffalo, New York and available exclusively to Tesla. Before being acquired by Tesla, SolarCity, like many other installers, bought solar panels from several different suppliers. Musk is now bringing panel manufacturing in-house, as part of an effort to create a distinctive brand. And that's where Tesla Solar comes in. Tesla has seen great success selling its high-performance -- and high-priced -- electric vehicles through its own showrooms (although the company had to fight for the right to sell direct to consumers in several states). According to Tesla's first quarter earnings report, the company's first attempts at selling solar via showroom have been successful, too. "We plan to reduce customer acquisition costs, including by cutting advertising spend, ceasing door-to-door sales and increasingly selling solar products in Tesla stores," according to the SEC filing. "In the first quarter of 2017, we tested sales of our solar and storage products in several Tesla stores and saw sales productivity improve by 50 percent to 100 percent relative to the best non-Tesla retail locations. Based on these results, we are working toward fully staffing more than 70 Tesla stores worldwide with dedicated energy product sales personnel over the next two quarters." So look for the Tesla Solar brand to be a lot more visible in the coming months.